Make a statement with this beautiful multicolored wooden pen for your EDC (Every Day Carry) with a Fisher Space Pen refill allowing to write wherever your travels will take you. 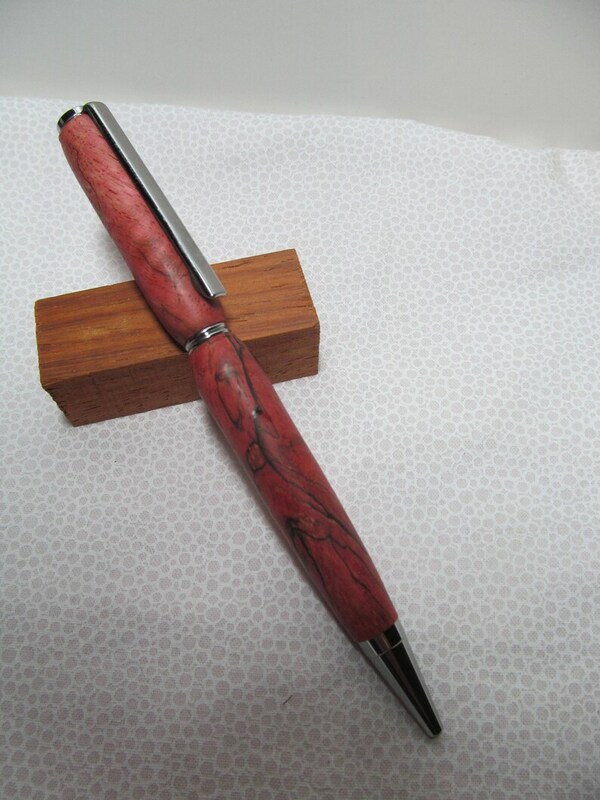 Makes a great gift for that person that is always on the go and needs a reliable pen. Pen measures approximately 5 1/2" long and is finished with chrome hardware. Accepts Cross style refills. Comes with velvet presentation sleeve. Pens are shipped USPS Priority Mail with tracking and are ready to go. If you are in the Loudoun County,VA area please contact us about local pick up or delivery before placing your order. I like the gold and wood combination of this necklace pen. It's a fat pen that writes smoothly. Perfect if you're traveling and don't want to carry a pencil case, or search for one in your bag. Repeat customer! Love all of the products. Great quality! PortablePastimes.com will accept payment via PayPal or if local delivery is arranged we will accept cash or check with proper identification. Please contact us directly in regards to large orders and we will be happy to create a special custom order invoice for you. All items will be delivered only after payment has been received. Custom orders will require payment to be made once final details are agreed upon via email. Items will then be made and delivered. Some custom orders may require an additional set up cost. If you are purchasing from us in person at a venue then we accept Cash, Local Check with identification, and Credit Card via Square. We want you to be happy with your purchase if an item is received broken or an incorrect item was shipped please contact us within 3 business days of receiving the item and we will be happy to exchange or correct. Please keep in mind that our items are made of various fabrics and woods and small imperfections are possible. Items may also be slightly different than those pictured on our website due to the differences in materials. If an item is not received due to delivery items please let us know within 10 days of shipping acknowledgement so we can initiate tracking. If you are local to the Loudoun County, VA area we would be happy to arrange pick up or delivery. Please contact us prior to ordering so arrangements can be made. We are always happy to due large or customized orders. All orders will be created as a custom order here on Etsy and payment will be required before shipping. We will require approval via email for each step in the process. Let us know what you would like to see, we would love to help you find that unique gift.